I always want to give a high five to plants that I see growing through concrete or in sand, like "go you!" Wonderfully captured. Love your use of contrasts and composition. It is the desire to be alive stronger than anything. Beautiful composition. Once again, Mother Nature triumphs. 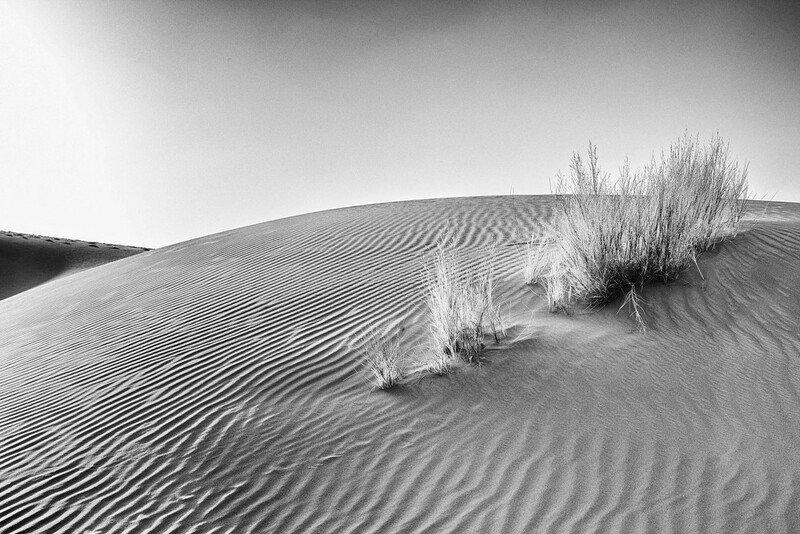 I can't get enough of these desert images. What a great series in black and white. Would make a nice echibition. This is amazing and another stunner. So good, you looked back on this great trip. @graemestevens Oh so agreed! The real champions of life! @overalvandaan Thank you very much, Saxa. @robz Thank you very much! I will add some more... Not that many, no worries! @yaorenliu You're right. Thank you very much! @kmwilliams Thank you very much! @mona65 Thank you very much, Mona. I do really appreciate your judgment! I love the ripples in the sand and the smooth curve. Great title, nature observation and gorgeous representation of the wonderful desert. Sublime lines, all squiggly and that lovely diagonal line of dry plants . . .
@bella_ss thank you very much! @s4sayer I was looking for this effect, thank you for noticing! @helenhall thank you very much, Helen! @kerosene hahaha a very real indeed belly! @jyokota thanks a lot, Junko! Just love this, the wrinkly head of an older punk dude! FAV!!!!! @joysabin Hahaha, imagine an octogenarian punk. LOL. Thanks a lot! @yrhenwr Too nice of you, thanks.